Bye to Biden: Farewell Joe? Last week, in the Rose Garden at the White House, Vice President announced that he would not be running for president in 2016. His remarks, which which incorporated both his and his family's deep sense of loss from the death of his son Beau combined with a strong stump speech about fighting for opportunity and the middle class, were bittersweet. I have written quite a bit about Biden. I don't necessarily agree with him on every issue, the man has his flaws. But he also seemed so human. His gaffes (which I always thought were over-played), his passion, his ready discussion of his own profound personal losses, showed that there was a real person. The infamous incident in which he was giving a spontaneous back rub to the wife of Secretary of Defense Ashton Carter. Biden was panned for his inappropriate behavior and taken as the quintessence of the male habit of invading women's space. I am deeply sympathetic to women's complaints about men inappropriately infesting their space. But it's not clear that is what Biden was doing. He is, by all accounts, physical with everyone he meets. 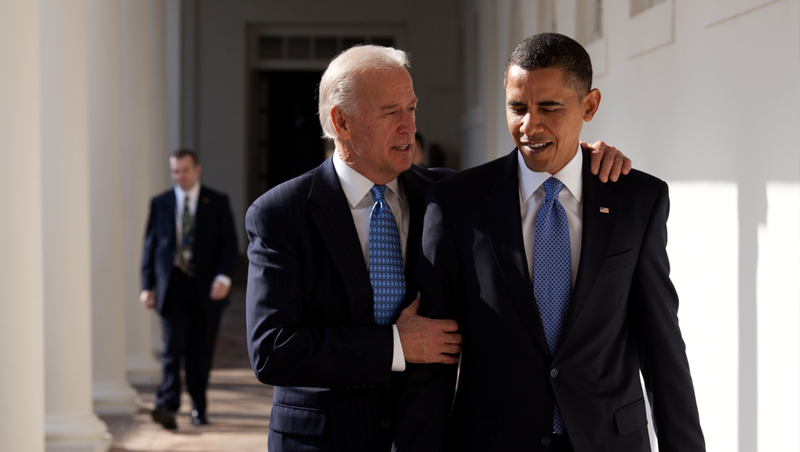 Plenty of male journalists have noted that an interview with Biden can involve a great deal of direct physical contact. He is, by all accounts, a very warm ingratiating person. He was an interesting vice president to study. Still, Biden worked hard to serve the president and support. It was a challenge, first because he had little standing the President Obama and second because of the legacy of Cheney - who was seen as playing an outsized role (a bit over-stated in the opinion of yours truly) - Biden need to show that he was not over-reaching. It is difficult to assess how much influence Biden excersized. He travelled extensively and to difficult places - he was point man on Iraq (hardly a credit to his record - but I didn't say he was a magician), among other things. He was a key interlocutor with congress. He oversaw some important domestic initiatives. Perhaps the most interesting role was "running interference" in the decision of how much the U.S. should commit to Afghanistan. This is a fascinating role. Vice presidents usually reserve their advice for the president so they are not publicly seen as taking sides in inter-agency squabbles. There are good reasons for this - among others no one sees the vice president disagree with the president (and be over-ruled.) It preserves an appearance of influence. But in the discussions on Afghanistan, Biden took an active role. Secretary of Defense Robert Gates thought this was deeply unwise and was strongly critical of the vice president's role. Obama said that he and Biden discussed questions to pose to the military and intelligence community. “There were times where Joe would ask questions, essentially on my behalf, to give me decision-making space, to help stir up a vigorous debate. And that was invaluable both in shaping our strategy of an initial surge, to blunt Taliban momentum, but also to lay out a time frame for how long we would be there." It was a unique and interesting use of the vice presidency - effectively as an offensive tackle in a game of bureaucratic political football. Other items were interesting as well. Biden's staff was closely integrated into the President's staff (maybe even more so than Cheney's) - at one point five Biden advisors were also deputy assistants to the president. Perhaps the best examplar of this rise of the VP's staff was the famous picture from the situation room watching the OBL raid unfold in which VPNSA Anthony Blinken is clearly visble. Several Biden allies, including Tom Donilon and William Daley held key jobs in the White House. At the same time, several Biden staffers moved into comparable White House positions, including Anthony Blinken (from VPNSA to deputy NSA) and Jay Carney who first served as the VP's press secretary before taking the same role for the president. Of course senior, experienced figures like Tom Donilon and Anthony Blinken might have had a prominent role in any Democratic administration. But still, it reinforces the role of the insider VP as a source for seasoned, insider staff. Biden had a tough act to follow as VP. But under his stewardship, the office certainly did not return to its historic insignificance and grew in some modest, but interesting ways. Having served the public for decades in the Senate and finally as vice president, Joe Biden can - with confidence - sit back into a comfortable retirement. Or is the vice presidency like the silver medal - the least satisfying of the winners. The bronze medalist is pleased to have won anything at all. The gold medalist is, of course, pleased. But what of the silver medalist - so close to the championship - but not the one who will be remembered. Hopefully, Biden - who has had a life of great joy and great sorrow - will feel he has earned the right to rest comfortably on his laurels. We have seen both the institutionalization of the Ex-Presidency and a modest growth in the role of the ex-VP. Mondale served as Ambassador to Japan. Gore, who won the Nobel Peace Prize and as Oscar as a former VP, has continued to advocate for action against climate change and has sought to reform capitalism. Cheney has also remained in the public eye. Will Biden to work for issues he cares about? It is hard to imagine he won't. By all accounts and appearances he remains full of energy and passion. Will he establish a Biden Foundation (the initials BF have been at the start of some of his most memorable phrases) that advances middle class values and American internationalism? It would be a fitting coda to a long and distinguished career. A great sunset on a helluva ride.